RENO, NV--(Marketwired - December 14, 2016) - As housing markets in San Jose dip into the red for the first time since 2011, an all-but-certain interest rate hike by the end of 2016 may push other over heated Californian markets over the cliff into the reality of falling home prices. With no major shakeups on our list of Highest Performing Major Metro Markets, the big newsmaker this month is out West as the tech metro of San Jose, Ca -- one of the nation's previously top performing housing markets since the market crash -- is reporting negative quarterly price growth for the first time in five years. Home prices are reported to have fallen 0.3% over the last quarter, the lowest current quarterly growth rate in the nation and a far cry from this market's peak growth rate of just under 6.0% QoQ during its recovery in late 2013. 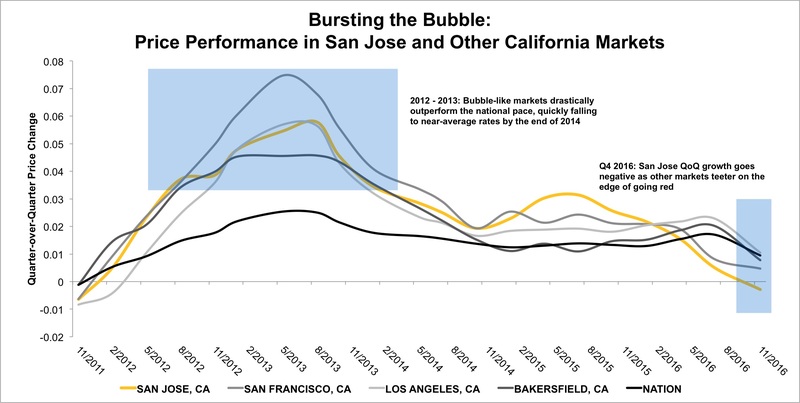 Additionally, there are other Californian markets teetering on the edge and exhibiting a similarly bubble-like behavior to San Jose, indicating that more markets in the state could turn negative in the very near future. San Francisco, Los Angeles, and Bakersfield are currently reporting 1.0% QoQ growth or less, each underperforming quarterly growth from this time last year by at least 0.7%. If the market climate of San Jose is any indication of what is in store for other high-priced Californian markets, more cities may dip into the red during 2017. Nationally, quarterly home price growth is holding steady at 0.9%, while national annual price growth has risen slightly to 5.6% -- an uptick of 0.1% since last month. Additionally, as market conditions across the county continue to improve, the national average distressed saturation rate decreased by 0.4% to 12.8%, a level which has fallen just over 2.5% in the last year. 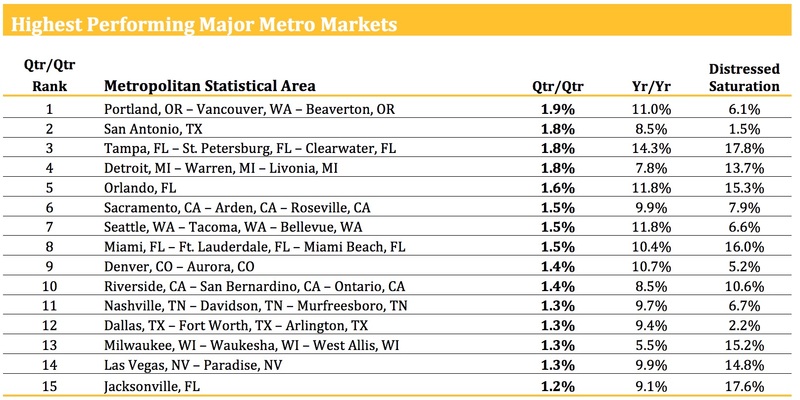 Regional quarter-over-quarter price growth remains largely unchanged since our last report, as the West, Midwest, and South all continue to hover closely around the 1.0% QoQ growth mark. Quarterly growth in the Northeast, however, has increased 0.2% to 0.5%, the highest reported quarterly growth rate for the relatively lethargic region since February of this year. "San Jose going negative over the last quarter is a huge deal, although no surprise given that growth in this market, and the Bay Area region as a whole, has greatly slowed over the last couple of years," states Alex Villacorta, Ph.D., Vice President of Research and Analytics at Clear Capital. "Rapid price growth combined with lagging, sticky income levels quickly pushed home prices out of the affordable range for a majority of homebuyers, which is a key factor in this market's recent downturn in performance. For this metro, turn times have slowed for both performing and distressed properties as demand has begun to slack, finally pulling the area into the red during this real estate slow season. While the San Jose market is the only major metro area in the nation reporting negative price growth, an increasingly likely interest rate hike by the Feds this month could just be the shock to the system that pulls other over heated markets even outside California and the West into the negatives, too. We're keeping an eye on the situation in San Jose and markets nationwide as we begin to put together our 2017 housing market performance forecast."